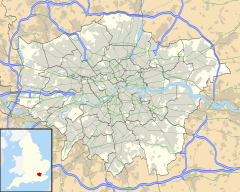 Norwood New Town is a largely residential, former working-class enclave within the larger district of Upper Norwood in Southeast London. It is within the London Borough of Croydon. In common with the neighbouring districts of West Norwood, South Norwood and Upper Norwood, it is named after the contraction of the Great North Wood, which once occupied this area. Norwood New Town was built from 1840 purposely as one of the main working class areas of early Norwood (the others were South Norwood and the 'Triangle' of Upper Norwood). It was built as a walled estate to separate its working-class inhabitants from the upper-class country houses and farm land, which at that time made up the district. Its construction commenced before the rebuilding of the Crystal palace on Norwood Hill but it became home to many of the workers employed on the construction of the Palace. The wall was demolished in 1930 and the district was integrated into the neighbouring area, which was becoming increasingly suburbanised. Buses use the A214 (Crown Dale) and the A215 (Knight's Hill). The high elevation of the area has made building railways very difficult so the area does not have a station of its own. The closest railway stations are West Norwood and Gipsy Hill. This page was last edited on 25 June 2017, at 00:09 (UTC).